Accra Great Olympics "the wonder club" of Ghana will be 50 years old, on Tuesday, April 21 and we take this opportunity to salute all the founding fathers. On that day in 1954, stalwarts like S.O. Glover, S.A. Okwabi, E.C. Oblitey, Adja Provencal Tettey and Amakah broke free to sow the seeds of Olympics from the ashes of Accra Standfast. Other founding members like KT Glover, Amos Josiah, JT Nartey and CT Nartey supported them in no small way. A statement issued in Accra and signed by Nana Addo Dankwah III, Chief Patron of the club said, "Since that day the seed that was humbly sown has germinated and grown into a mighty tree that has chalked many laurels". 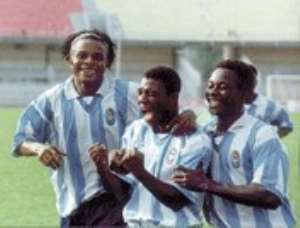 According to the record books, Olympics is the first Ghanaian club to employ the services of a foreign coach Lowenstein and the first club to achieve a run of 38 matches undefeated. The club is also the first to represent the nation in an international against Togo National team winning 2-1 in Lome in 1958. It is also on record that Olympics is the only team that has scored the highest number of goals in the Africa Clubs Championship beating MMM Madagascar 7-0 in Accra and has also won the national league, the knock out and the champion of champions trophies at various times in its history. The statement added, "It is not for nothing that the late Ohene Gyan, Director of Sports gave Olympics the accolade "Wonder Club" because it is the only team in Ghana which starts and ends each season in rancour and somehow manages to survive. "Olympics undoubtedly has experienced more mixed fortunes than any other team in Ghana and yet continues to march on in unity and confidence". "As we enter the dawn of the Golden Age of Accra Great Olympics, we wish to acknowledge the invaluable role of the Council of Patrons, Shareholders, Board of Directors, Management Team, the Welfare Committee, Technical Team, Playing Body and the numerous supporters of the club and to encourage them to continue in unity with greater confidence in the glorious future of the club. There will be more wonders this season and a comprehensive programme for a year of celebration will soon be released, the statement concluded.